Hiding in My Craft Room: HIMCR #167 Winner! Oh my goodness! Wednesday is almost over and I haven't posted last week's winner yet! It's just been one of those days! HIMCR #167 - Any Holiday! The giveaway is 3 images, winner's choice from Scrapper's Delights! Congrats Marilyn! Please use the 'Contact Me' button to send me your email! That's all I need! Thanks so much for all the many wonderful entries! And a big thanks to Scrapper's Delights! Don't for forget, while your here, to check out this week's challenge! Thanks for visiting today! I love getting your feedback and reading your comments! HIMCR #171 - Any Holiday! HIMCR #169 Winner and Giveaway Winners! 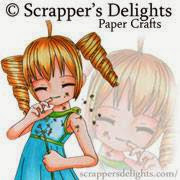 HIMCR #169 - Super Scraps Saturday! HIMCR #168 - Halloween Colors! Just in the Nick of Time! All content on my website is intended to be for instruction and/or inspiration and is copyright Laurie's Craft Room. Feel free to copy and share for personal use but please do not claim my work as your own. All my videos are also copyright Laurie's Craft Room and may not be uploaded to any 3rd party website or blog without my written permission. I use mine almost every day! What time is it here?